Savvy Spending: Domino's: Free Medium 2 topping pizza with new Points for Pies Promo! Domino's: Free Medium 2 topping pizza with new Points for Pies Promo! REMINDER: Have you been doing this? I've already earned a free pizza with this promo! Wow! Here's a fun freebie! 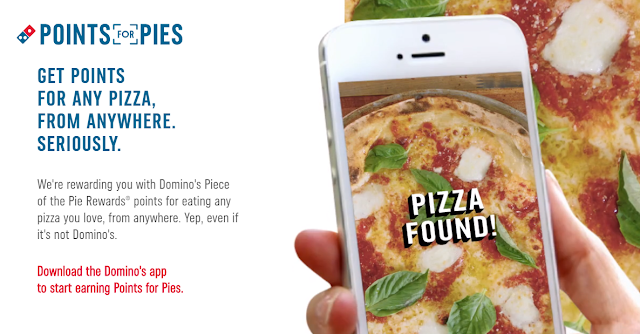 Beginning 2/2 and running through 4/28, Domino’s Piece of the Pie Rewards Members who upload a photo of any pizza once per week for six weeks can score a FREE medium 2-topping pizza . No other purchase is necessary! You will need to upload your photos on the Domino’s app. You can take a photo of ANY Pizza (frozen, store bought, a competitor, homemade, etc) and it can be a picture of a slice or a whole pizza. Starting February 2nd, locate the “Pizza Scanner” to scan a slice of pizza or whole pizza – may be any brand of pizza or may be an image of a pizza. And once you have earned 60 points, you can redeem them online for a FREE medium 2-topping pizza at a participating Domino’s locations!